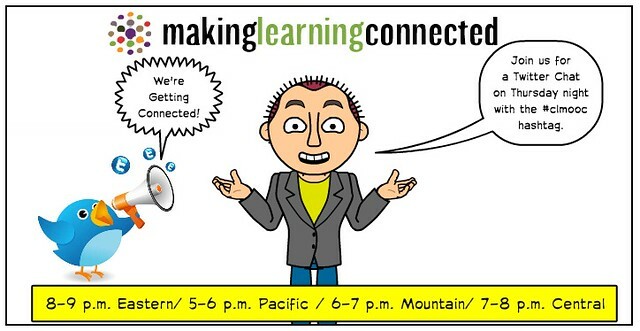 We invite you to come join us for the first Twitter Chat for the Making Learning Connected Massive Open Online Collaboration (MOOC) as we explore how the first week of the MOOC has been going, give some teasers of where the MOOC is headed, make visible some of the connections to the Connected Learning principles, and answer questions that YOU may have about the summer project (already with hundreds of teachers involved). A Twitter Chat is a freewheeling conversation that is anchored on Twitter with a hashtag (in this case, we are using #clmooc) that then later gets archived and shared back out to the community. I hope to “see” you there, as we extend our MOOC conversations in every little corner of the Internet.